The 'museum extension fever' we mused about earlier in the year was soon threatened by a combination of funding fumble and council kybosh, but what's happened since then? The British Museum's £135 million extension, designed by Richard Rogers' firm, was snipped by Camden Council who deemed it a "massive over-development". 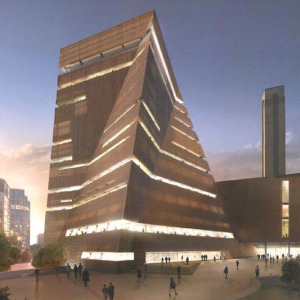 Designers have reacted by preparing a revised plan that increases the space between the new pavilions and buries part of the structure underground — a strategy employed by the new National Maritime Museum wing. They're hoping that Camden will drop their objection to the extension's scale, which the council were alone in making (English Heritage and CABE waved it through). The new proposal should drop on the welcome mat at Camden HQ within weeks. As for the Tate's striking ziggurat: last week, director Nicholas Serota was all bombast as he unveiled his galleries' forthcoming autumn season, boasting that the Tate's coffers had grown to the tune of £100 million through philanthropic donations, and claiming that a third of the funding for the extension was in place, meaning construction could even begin next year. But how secure is it? The Guardian sounds warning bells, noting that they've barely raised any additional money since this time last year, that donors are still reticent to come forward with pennies for the project, and that a good sum of the money thus far agreed is based on a wing and a prayer from a cash-strapped Department for Culture, Media and Sport, who are busily reviewing all their spending commitments. That situation is likely to get worse should the Tories win the forthcoming election. While new-gallery freakniks wait and see the outcome for these twin behemoths, there's always the just-opened phase 2 of the Darwin Centre to explore.